Listen up! You’ve all heard about the great men who led and fought during the American Revolution: but did you know that the guys only made up part of the story? 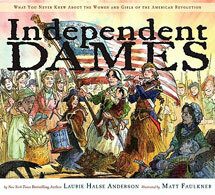 Of course they did, and with page after page of superbly researched information and thoughtfully detained illustrations, acclaimed novelist and picture-book author Laurie Halse Anderson and charismatic illustrator Matt Faulkner prove the case in this entertaining, informative, and long overdue homage to those independent dames!